An Olympic athlete is always working to shave a fraction of a second off their fastest time, jump just a little bit higher, or make their landing off the balance beam even smoother than before. If they do, it could mean the difference between winning a gold medal or not making it onto the podium at all. Improving the conversion rate on your ecommerce site is a similar pursuit of winning against your competitors and should be an ongoing task. There is always something else you can do to improve the customer experience and increase sales. Last week we looked at four conversion rate optimization (CRO) case studies that examined various challenges of running an online store. Building on that, today we’ll be looking at additional ones that cover email list building, exit intent offers, coupon boxes and revenue per visitor. Apart from making actual sales, capturing email addresses of would-be customers is the most important thing a successful ecommerce site must achieve. It is usually done either through the shopping cart (e.g. a visitor has started the checkout process but has not finished it), or by simply asking for their email via pop-ups. But there are many different ways to incentivize the ask. SkinnyMe Tea, which sells quality teatox products, recently offered a 5% discount code and a free eating plan in exchange for an email address. Thanks to these offers, the company’s email opt-ins increased by 758%. And thanks to the discount code, their sales conversion rate went up by a full 1%. Not bad. Isle Surf & SUP decided to go another route by offering a chance to win prizes in exchange for an email address. The result? Opt-ins were increased by a massive 660%. Now, to be fair the company was running multiple AdWords campaigns at the same time which increased traffic by 36%. Still, even when taking that into account, the email capture contest worked very well. 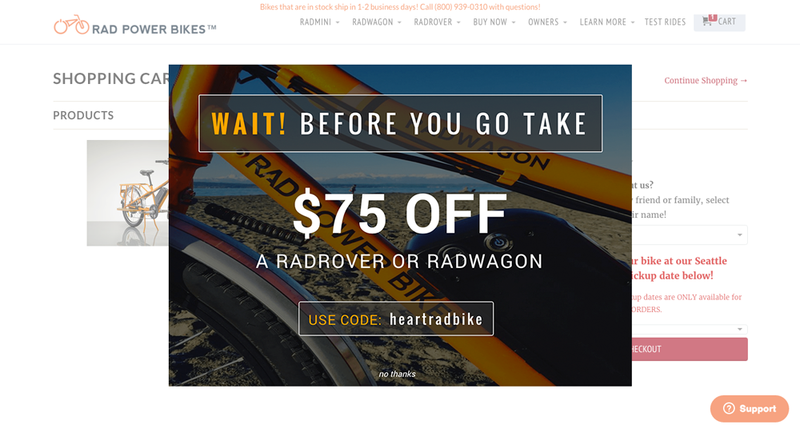 Rad Power Bikes decided to not to use a special offer, asking only to subscribe to “learn about sales, promos, and new products.” With this simple tweak, its email capture increased by 302%. As you can see, there are multiple ways to convince visitors to give you their email addresses. Play around with your options and stick with what works best for you. Another important factor is timing. Do you display the offer in the beginning, in the middle of browsing, or just at the moment that visitors are about to leave? There are no right or wrong answers. It will always depend on what you sell and who your customer is. Experiment with displaying the offer at different times and use the best result moving forward. A customer adds a product to the shopping cart and clicks through to the checkout page. They’re about to make the purchase, but suddenly, they exit the page. Why? Maybe it’s to find a coupon, maybe (s)he wanted to see the final price with shipping and taxes but decided the final cost was too high. Whatever the reason, that customer is gone. What if there was something that you could do right at that moment when you’re about to lose the sale to make them change their mind? It’s called an exit intent offer, and it’s displayed right at the second that your potential customer is about to leave. Usually, the offer/incentive is a certain percentage off or dollar amount off if the customer buys right away. It sounds and seems a bit gimmicky, I agree, but it also works. KUTOA tried it and saw their sales conversion almost triple from 0.58% to 1.67%. Triple the sales with just this one small change. Try it, run it and let us know your results. Coupon Box at Checkout, Conversion Killer? In 2015, the average shopping cart abandonment rate was 73%. 73%! That means that for every four people that get to your checkout, only one of them ends up buying. That’s not okay. There’s a myriad of reasons for it, and we have covered it extensively before so there’s no need to go over it again. Instead, let’s take a look at what a company called Bionic Gloves, in co-operation with a Portland-based marketing & conversion optimization agency Sq1 discovered while testing different iterations of their checkout flow. Their hypothesis was that by having so many prominent boxes, it was confusing customers and driving them away (or to look for discount codes). The solution was to test out a variation of the same page that removed both “Gift Card” and “Special Offer” boxes completely. After running the test for well over a month, the results were positive. Their primary goal was to increase revenue both as a whole and on a per visitor basis, and they succeeded in both. The variation increased revenue per visitor by 17.1% and total revenue by 24.7%. Success. While the test was successful in bringing in more revenue, it did so by eliminating all gift cards and discount codes which are not ideal. Gifts cards and especially discounts codes can drive real traffic and extra sales. Whichever way you decide to go, make sure that your decision is based on actual testing data and not just your gut feeling. In testing and optimizing it’s easy to get carried away with seeing amazing results (e.g. a 43% lift in cart adds) and conclude that since it’s a clear winner, it’s fine to roll it out to production. That would be a mistake. You see, results are not counted on how many people added items to their shopping cart and rather on how many of them ended up buying. Sometimes tests that show great promise on whatever action was tested end up making fewer sales. It’s counter-intuitive, but it does happen. Being wary of that, when VeggieTales hired Blue Acorn to run their optimization program it was decided from the get-go that the metric that would eventually decide everything is Revenue Per Visitor (RVP). Whatever the test results showed, it had to move the needle on revenue. With VeggieTales, it wasn’t one test that changed everything but rather a series of subtle changes. By first examining analytics data, they had a good overview of where to start and what to test. Without the banner, category pages produced a 17.4% increase in Revenue Per Visitor (RPV). The new product page variation produced a 13.9% increase in RPV. Checkout is THE most important page in ecommerce; this is the place that the actual sales conversions happen. For VeggieTales, the page had the same header and footer elements as on other pages. It was not that these looked somehow off or were designed poorly. It’s just that at checkout, these can be distracting and drive customers away. So a variation was produced that removed all the unnecessary clutter, leaving what’s needed to complete the checkout on the page. The more streamlined checkout look produced a 14.3% increase in revenue per visitor. Social media is obviously critical for any ecommerce company. It’s a good place to talk directly to your customers, share new products, run ads and more. The question is: Can all this be somehow used to drive more sales on the main landing page? VeggieTales has a sizable community of fans on different social media sites, and so they decided to test if showing the size of social followers had any effect on sales. The initial hypothesis was that by displaying social followers prominently, it will act as social proof and secondly, will drive more people to follow them. The results showed that not only had they gained more fans and followers, but the variation had produced an astonishing 36.8% increase in revenue per customer. This result was the biggest win of the whole lot and it came by making a slight change. Amazing. All in all, after running the highlighted tests and more, year-over-year, the company saw a 42% increase in site-wide conversion rate and more importantly a 38% increase in revenue per visitor. Take these case studies not as something to blindly copy but rather as an inspiration and only when your data supports similar tendencies should you go ahead and consider running similar tests on your store. No matter what any case studies says about results, every store is different and it attracts different audiences. Just because something worked for others doesn’t necessarily mean it will work you. Be aware of that. And good luck testing!